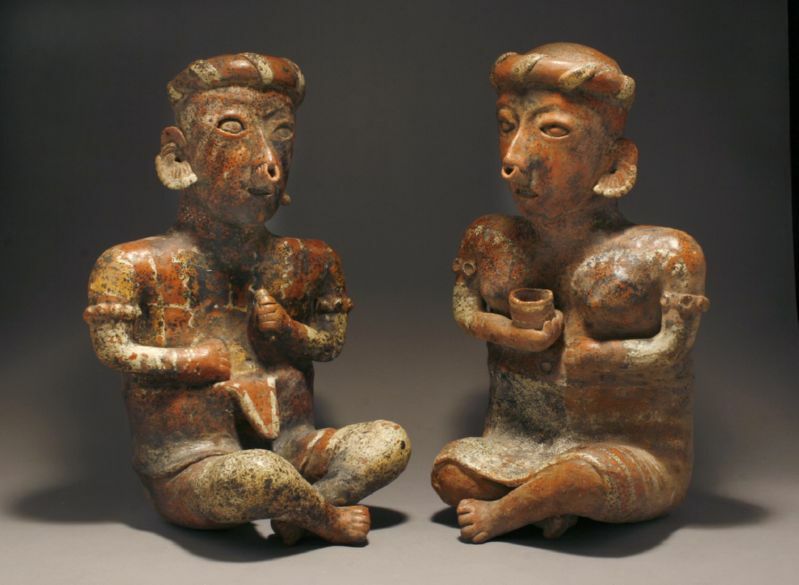 Ixtlan del Rio Style, displaying highly refined sculpted details, both seated cross-legged, the male holding a rattle in his left hand, the female holding a small bowl in her right, perhaps symbolic of their societal station. They are both wearing "twisted turban" headdresses and garments decorated with similarly painted designs, as well as facial and body tattooing. Provenance: 1) Harry Franklin, Beverly Hills, CA during the 1960s. 2) Leonard Kaplan, Laguna Beach, CA, 1960s. 3) Private Collection, Laguna Beach, CA from the 1960s-2010.